For most of what has transpired of the 2010 Atlantic hurricane season we have seen the Caribbean, really a whole region from northern Colombia and Venezuela, through Central America, to southern Mexico, including all of the adjacent eastern Pacific and the southern Gulf of Mexico, close to the boiling point as the atmosphere-ocean environment has been continuously fed by high humidity, an unending supply of rain cells and thunderstorms and regular pulses of tropical waves generated over equatorial Africa, which keep finding their way to “Hurricane Alley’ in the Atlantic as they move westward toward the Lesser Antilles and the Caribbean beyond. Satellite view of 11 October 2010 showing tropical storm PAULA over the Bay of Honduras moving toward the northwest and Belize/Quintana Roo, with sustained 65 mph winds and plenty of rain and thunderstorms. In less than four weeks we’ve seen tropical cyclones Karl, then Matthew and Now Paula emerge from tropical waves in the Caribbean and ‘explode’ near the region of Cape ‘Gracias a Dios’ near the Nicaragua-Honduras border, to then move beyond toward Belize and the state of Quintana Roo in Mexico and neighboring areas. Forecasting these cyclones, which have been generated so close to the landmass of Central America has been difficult, especially as they have moved generally toward the northwest and have come under the influence of frontal weather systems and areas of high pressure and dry air that have moved toward the Gulf of Mexico. This has been reflected in the so-called ‘cone of uncertainty’ in the projections issued by the National Hurricane Center. 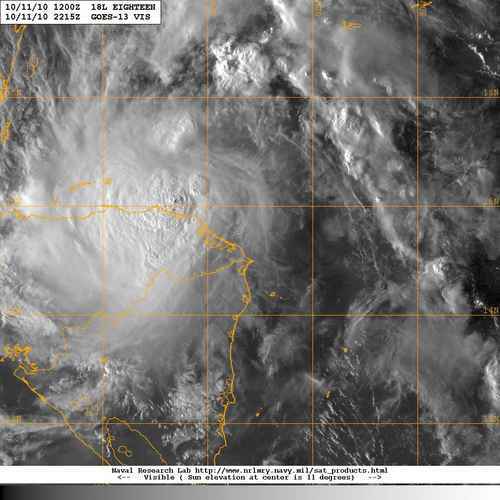 Satellite view showing water vapor in the atmosphere, which helps visualize the various external factors affecting tropical storm PAULA as it moves over the northwestern Caribbean. Currently tropical storm Paula is in the Bay of Honduras moving generally northwest toward Quintana Roo, with sustained winds of 65 mph drawing moisture from as far as the eastern Pacific near Panama and Costa Rica to the Florida straits. The storm is moving in an environment of warm water and humid air that is conducive to further strengthening making it highly likely that PAULA may become a hurricane in the next 18 – 30 hours. Track forecast for tropical storm Paula by the Navy Research Laboratory on 11 October 2010 at 1800 EST. Notice how the uncertainty in forecasting what wil happen with this tropical cyclone is reflected in a 'circle' of uncertainty rather than the 'cone' of uncertainty we regularly see. rather than a cone centered somewhere in the northwestern Caribbean off the coast of the Yucatan Peninsula, and a tropical storm and quite possibly hurricane Paula meandering and possibly backtracking over the Caribbean. Does this mean the cyclone will remain over water and never make landfall? Or that it may actually strike the coastal region of Quintana Roo? What happens as the storm meanders over the northwestern Caribbean and the dome of high pressure over the Carolinas moves farther east? 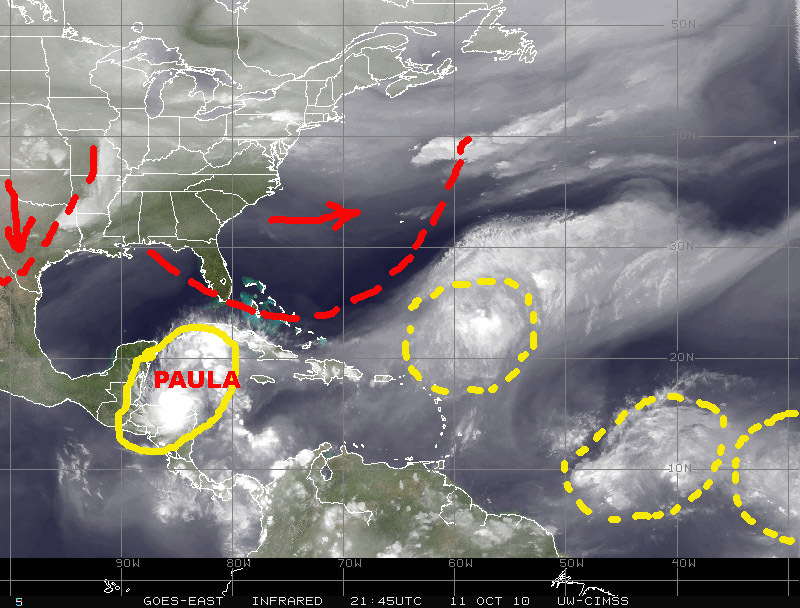 Would this actually ‘pull’ Paula toward the northeast and Cuba, the Bahamas or even Florida? Or will the system downgrade to just a big area of thunderstorms and rain and eventually dissipate? What happens if one of the tropical waves now in Hurricane Alley enters the Caribbean and begins to influence Paula 3 -4 days from now? The uncertainty of forecasting in certainly evident with Paula. Such forecasting uncertainty also illustrates the dilemma faced by emergency managers and civil defense authorities in those countries around the Caribbean basin and beyond, which might be in the future track of Paula. With so much uncertainty how do coastal communities that may be impacted by Paula prepare? What do they prepare for, extreme rain, wind, storm surge, a combination of all or none of the above? For coastal regions in Honduras, Guatemala, Belize and Quintana Roo there is no time to waste, as some of them are already beginning to feel the impact of Paula. Composite of several satellite views on 11 October 2010 shows the Caribbean, Hurricane Alley, equatorial Africa and beyond. Water vapor in the atmsphere makes it easy to see not only tropical storm Paula, but also the several tropical waves just to the north of the equator that are marching westward over equatorial Africa and the still warm waters of the Atlantic. Looking toward the east over Hurricane Alley and equatorial Africa numerous tropical waves can be seen moving in the general direction of the Caribbean, just as we have seen for most of the current hurricane season. The only noticeable change in this process is that the train of tropical waves appears to have shifted shlightly toward a more southerly route, and the density and size of the tropical waves appears to be diminishing. There also appears to be less moisture in the atmosphere around Central America and the adjecent eastern Pacific as well as the eastern Caribbean than we had seen just a couple of weeks ago, possibly in response to the onset of autumn in the northern hemisphere. Full-disk view of Earth's western hemisphere on 11 October 2010. 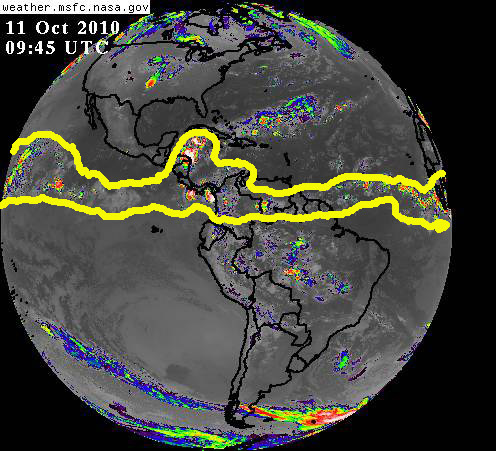 The 'belt' of tropical activity continues to circle the globe just above the equator.